The sound of splashing drew me to the stream. A dark finned back cut the surface. Salmon? The fish came into view and its snout was a giveaway, maroon-hued and curved like a hook. This was a spawning male Chinook salmon. It alternated between chasing another hooknose and two jacks, small males that sneak in to add their sperm to the mix when a standard male and female are spawning. The source of the commotion soon became clear: A mottled female was turned on her side and fluttering her tail in a patch of clean gravel, digging a nest, or redd. Several small rainbow trout hovered nearby, waiting to feast on loose eggs. The scene I’m recalling from December was not the Sacramento River or some other salmon highway, but a lowly back alley long associated with carp and suckers: Putah Creek, my hometown stream west of Sacramento. Shortly after my find, I was involved in a discussion about a new bridge being built on the creek in the Yolo County community of Winters. Chinook salmon had recently been seen spawning at the construction site. Workers were preparing to remove temporary supports from the span. Would the embryos buried in the gravel be destroyed in the process? This past fall, however, more than 200 salmon came up the creek and spawned, or tried to, using every patch of gravel between the dam and the UC Davis campus, including the patch by the new bridge. The number is tiny compared with the thousands of salmon that return annually to California’s Central Valley. But it’s the highest population recorded in the 30 years, when my UC Davis students began taking annual fish surveys of Putah Creek. The previous high was about 70 salmon, a decade ago. In most years fewer than 10 salmon can be found in the 27-mile-long stream below the diversion dam. Putah Creek has its headwaters in the Mayacamas Mountains that divide the Napa and Sonoma valleys and once spawned in the now-drowned Berryessa Valley. Most of this past fall’s salmon run used the freshly “ripped” gravel in the first few miles below the diversion dam. The Solano County Water Agency, which operates the dam, greatly increased the chances of a productive spawn by ripping through the concrete-like layer of clay and sand covering the gravel. Using heavy machinery, the agency’s Rick Fowler uncovered smooth stones of many sizes, ideal for spawning. As an experiment, alternating stretches of the creek were left as they were. Not surprisingly, no salmon spawned in these areas. So why the sudden influx of salmon into Putah, during a drought no less? The reasons reflect the many challenges California faces trying to retain self-sustaining salmon populations. The most optimistic reason is that this year’s spawners are progeny of earlier spawners, 2 to 3 years ago. We have observed juvenile salmon migrating downstream during the spring, and local naturalist Ken Davis has recorded juveniles summering in the cold water below the diversion dam. Presumably these fish moved out as the water cooled in the fall, especially after a rain. However, it is more likely that most of this year’s salmon were strays from hatcheries. About 25 percent of hatchery fish are marked by removing the adipose fin and we observed carcasses with this fin missing. The large number of hatchery strays could be explained by a series of events in the first week of December. At the mouth of Putah Creek, a man-made canal known to trap wayward salmon drew an unusually large number of strays. The heavy rain that week could have accounted for this. Flush with stormwater runoff, water flowing from Cache Slough into the Sacramento River could have been as attractive as the low flows from the drought-stricken river itself. The wrong turn at Cache took salmon up the dead-end canal, known as the Toe Drain of the Yolo Bypass. (A small board dam that sends water to the Yolo Basin Wildlife Area keeps fish from entering Putah Creek until the first week of December, when the boards are removed.) California Department of Fish and Wildlife crews with nets rescued some but not all of the trapped strays and returned them to the Sacramento River. To salmon remaining in the muddy Toe Drain, Putah Creek would have seemed like an attractive option – especially once the stormwater started flowing down the stream. 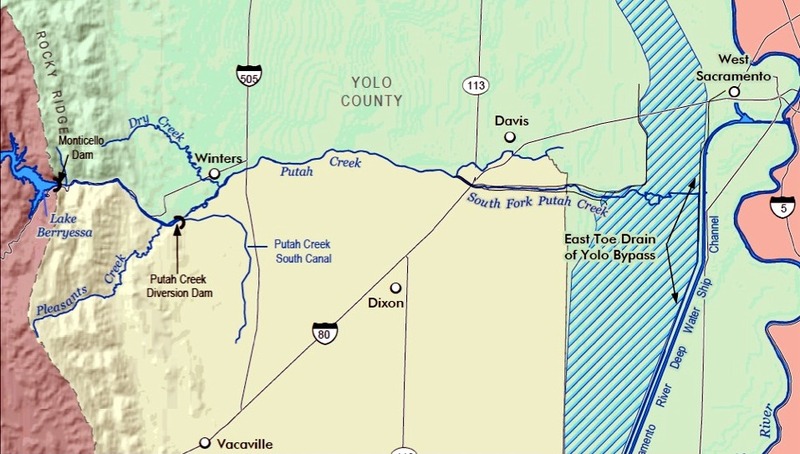 The first fish up the creek would have found a small board dam in the bypass blocking their way; the dam sends water to the Yolo Basin Wildlife Area until the first week of December, when the boards are removed. Salmon were observed swimming upstream immediately after the boards went off. The biggest influx apparently occurred during with the five days of pulse flow from the diversion dam, which coincided nicely with the inflow of stormwater runoff. 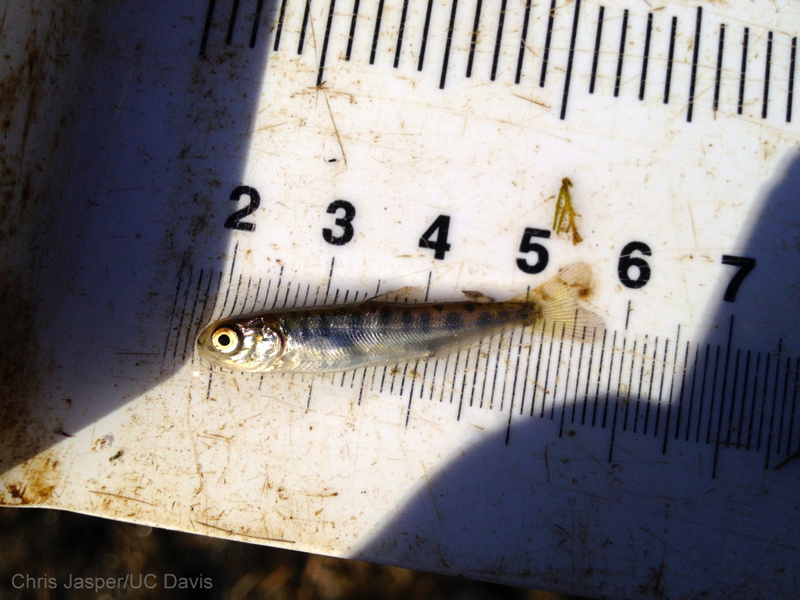 UC Davis science students recently found some small salmon fry in Putah Creek. Photo by Chris Jasper, March 7, 2015. Whatever the reason for the surge in Putah Creek salmon, I will be watching for young out-migrants in the creek this spring. Earlier this week, a team of UC Davis undergraduates led by Chris Jasper found some small (1.5 inch) fry in the creek on campus. These fish had clearly just emerged from a redd. I can only hope some of these fish are the progeny of naturally produced adults from previous years. 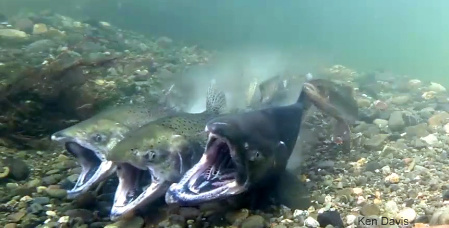 Studies elsewhere have shown that juveniles of wild salmon parents have much higher survival rates than those of hatchery-born salmon, even if those parents spawned in the wild. If wild fish are not swamped out each year by less fit hatchery fish, natural selection – evolution – can start to work again, producing fish better able to live under the changing conditions of our rivers. It would be good to see what is going on in Putah Creek occur in larger rivers, with thousands of fish. This can happen only if we radically change our management of hatcheries and salmon in dammed rivers (Katz and Moyle 2012). It would be wonderful if every fall families could go to bridges and banks and look down on huge salmon spawning in their local creek. Putah Creek as salmon stream – hold that thought! Peter Moyle, a professor of fish biology, is associate director of the Center for Watershed Sciences at UC Davis. Case, E. and LeCompte, C. 2014. The Putah Creek Legacy. A five-part multimedia series by The Davis Enterprise and Climate Confidential. Kiernan J, Moyle P, Crain PK. 2012. “Restoring native fish assemblages to a regulated California stream using the natural flow regime concept“. Ecological Applications. 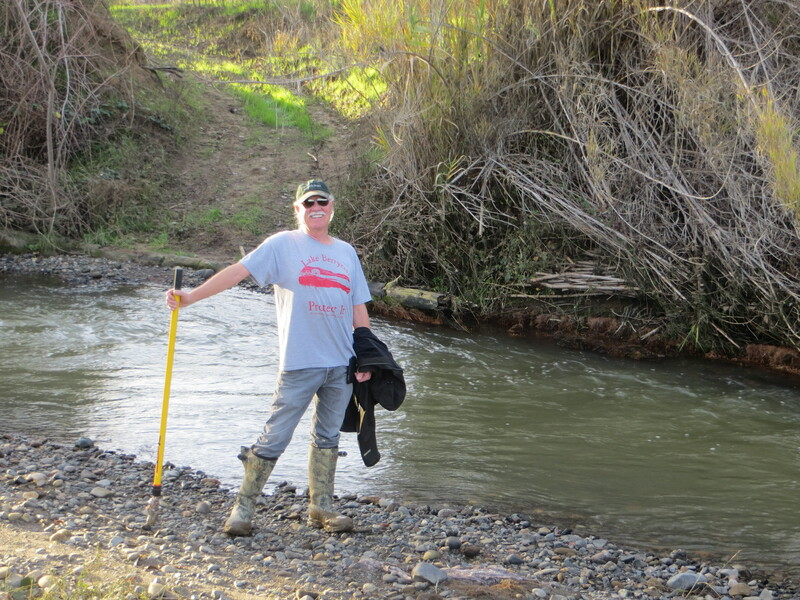 This entry was posted in Fish, Salmon and tagged Peter Moyle, Putah Creek, salmon. Bookmark the permalink. 5 Responses to Salmon finding a home in my backyard – Could it be? What a wonderful report! I lived on Putah Creek Road east of Winters for two years during the early seventies. I would take long study break walks along the creek. Small trout were evident during the winter when the water was deep and cold. A beautiful thing that the salmon have returned, under whatever circumstances. What an amazing story! It’s truly amazing that you are all working so hard for the salmon, I am truly blown away. I am Augustus The Fish and I use my blog in conjunction with The Age of Fishes Museum to bring to light issues facing fish today. I have yet to see a post go public on this site(did I just miss it?) about the positive effect of beaver ponds on young salmon. BTW they remove nitrates from streams as well— Lake Tahoe, are you listening? It is time to include this potentially very important field into planning for water and fish management in California. In a time of crisis we cannot afford to overlook something this significant. For starters, run, not walk to secure a copy of Ben Goldfarb’s Eager, the Surprising, Secret Life of Beavers and Why They Matter.